The 2014 Muddy Boots season has now finished. We ended with a celebration session during which we planted bulbs to see flower next year and ate a shared lunch. We also carried out some feedback and appreciation activities. I created a photo book using images taken throughout the year to show the group. This was handed round and participants were invited to add their comments on the back-cover. I also asked people to add their thoughts to a group evaluation in the form of a picture. See below. This worked quite well and was more fun than yet another evaluation form. If participants had not completed the mid-point evaluation form, then I did ask them to complete one at the last session. 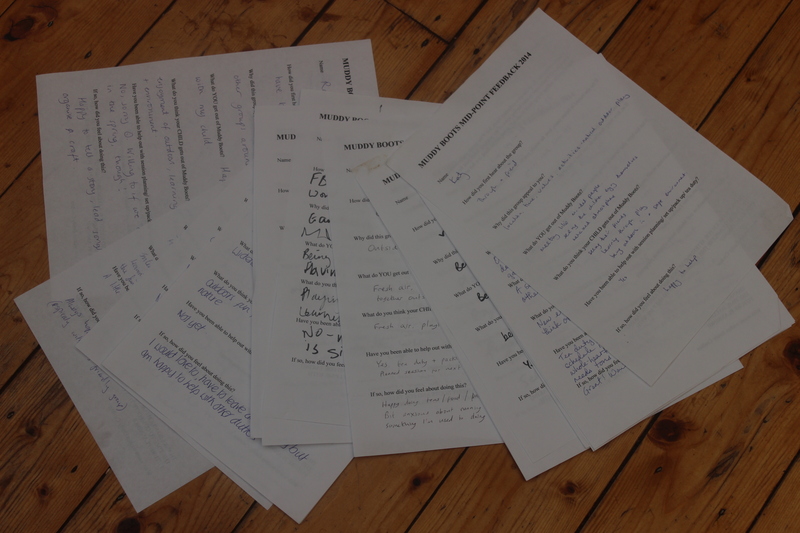 I collected 17 forms in total and have collated the findings. Why did the group appeal to you? location, time, ethos, values, natural outdoor play, to learn about gardening, to spend time outdoors and healthy shared snack time. Have you been able to help out and if so, how did you feel about being asked to do so? 8 No, 7 tea duty/ washing up, 5 pack/set up, 7 session leading. 7 happy to help out, 6 willing to help in future, 4 unable to help due to children. Would you be willing to travel to a different site? Is so, how far? 1 person said don’t move, 1 person said I have no transport, 1 person said yes, less than 5 miles, 7 people said around 5 miles, 1 person said more than 5 miles and 6 people were happy to follow us where ever we moved to. Should I put a cap on numbers of families attending? 5 said no cap, 4 said cap at 10, 5 said cap at 15, 1 said cap at 20. What have been your favourite things about Muddy Boots? Activities, planting. being outdoors, watching children play, the sandpit, growing food, meeting people, the relaxed atmosphere, the good vibes, exploring the site, learning about Permaculture. What haven’t you liked/ what changes can you suggest? It has been too busy on occasion, need a bigger space, have a longer session, have proper mugs for tea rather than the plastic glasses, continue all year round. What activities should I run in the future? Natural crafting, digging, nature art, mini gardens, treasure hunts, planting, songs, water/ mud play, plant identification, longer sessions, more time for free play, harvesting, stories, exploring, keeping chickens, making fires, making shelters Caterpillar/butterfly keeping, nature lanterns, nature bracelets, leaf rubbings, pumpkin carving, seasonal celebrations, mud kitchen, cooking and eating. SO IN CONCLUSION…. people enjoy the ethos of the group, the activities and ideas behind it. They want a longer session, they are happy to move but not too far, they are happy to pay more- maybe £4-5 each session. 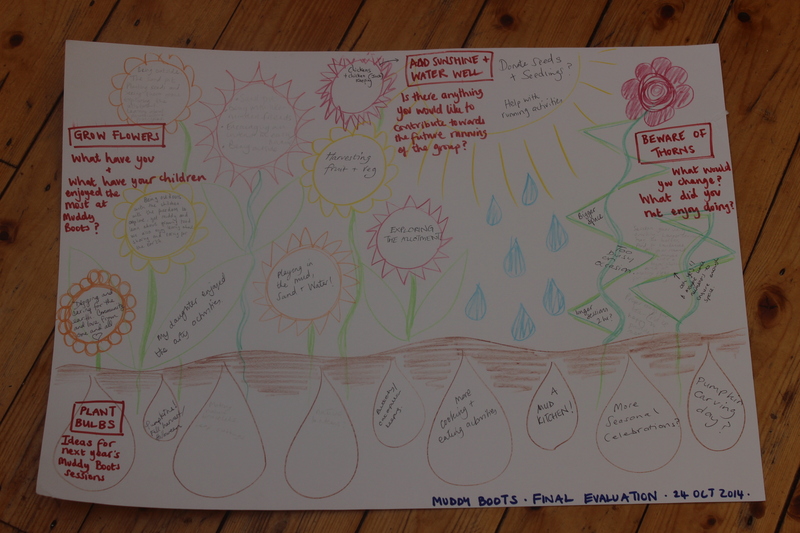 I have looked back at the 8 key functions I identified for Muddy Boots in the planning stages and reflected on how successfully they were achieved. To teach children about food growing I think I started to introduce ideas around this subject We planted the following; runner beans, strawberries, sunflowers, peas, courgettes, beetroot, radishes, tomatoes, peppers and herbs plus flowers and bulbs. We harvested; much of the above list plus, cucumbers, grapes, blackberries and lettuces The key function needed to be more specific – too general. To inspire a love of nature and art Yes – but I do think that only parents and children who already have these interests were the people who were likely to attend this group. Art– we tried willow weaving, potato printing, hand printing, colouring in sheets, we made a beanstalk sculpture, we created food faces, we sang songs and played with instruments. Nature – we planted seeds and bulbs, we made bird-feeders, we went on a bug hunt, we celebrated finds from the natural world each week, we played with pinecones, sand, mud and water, we learnt about animals and insects. “Playing outdoors, getting muddy, being creative, freedom to get dirty” – we quoted as being things the attending child enjoyed most in the feedback forms. This is really two key functions not one. To be a safe and welcoming environment for parents and their pre-school age children Yes Safe– No accidents or injuries reported other than the normal slips and falls. One child fell off a chair once. Welcoming– I had lots of written and verbal comments about how welcoming and friendly the group felt. Again this is 2 key functions really. 16 people came to only 1 session – This is a big drop off but some of these people were grandparents attending with regulars, friends from out-of-town, but also some people who just decided it was not for them. On average we had 27 people per session – 12 adults and 16 kids. Of the top 10 attenders, the average number of sessions attended was 6 times out of 14. There was a core of 12 families who attended regularly and lots of others who dropped in and out throughout the season. Some new friendships were forged and others re-inforced by the group. The link to LNM FB group was important, as was the formation of the MBAP FB group. Quote from the end of season evaluation “ Muddy Boots is a huge ray of sunshine in our lives. We look forward to every session. There is so much to learn, so much to share and a lovely sence of community and sharing. I don’t know what we would do without this group” but will these friendships and networks endure once the group ends? How can I help with that? To keep the education space of the community allotment looking good. (I designed this space for my PDC design project in 2012) Not really There was not time factored into the sessions for general site maintainance. We did however add some lovely features like the pizza pots, tin can flowerpot and sunflowers. I had to spend extra time at the allotment to keep it looking ok and the com allot people mowed the grass etc. Positive aspect of using the com allot- is there are lots of other people to help with site upkeep. Negative aspect is I don;t feel ownership over the space. To be a learning opportunity for myself, possibly leading onto an income generation project in future years Yes and maybe It has been a great learning opportunity and running it alongside a P design project has really helped. Yes there is a possibility of generating income from this in future years. Needs lots more thought and planning. To be a community run group that uses and values the individual skills of the participants Yes I think this key function was met very well. I had lots of help for the more mundane jobs like setting up/ packing up/ tea duty but also six people ran sessions. There skills like music, art, baby signing and guitar playing were used and appreciated. How do I keep this community feeling while exploring the income generation potential? For families to enjoy playing and learning together outdoors Yes Lots of positive comments along these lines in the feedback and evaluation activities. A further form of feedback I have received is the post-it-note comments I gathered from the other participants on the PDC when I gave my 5 minute presentation about my design for Muddy Boots. 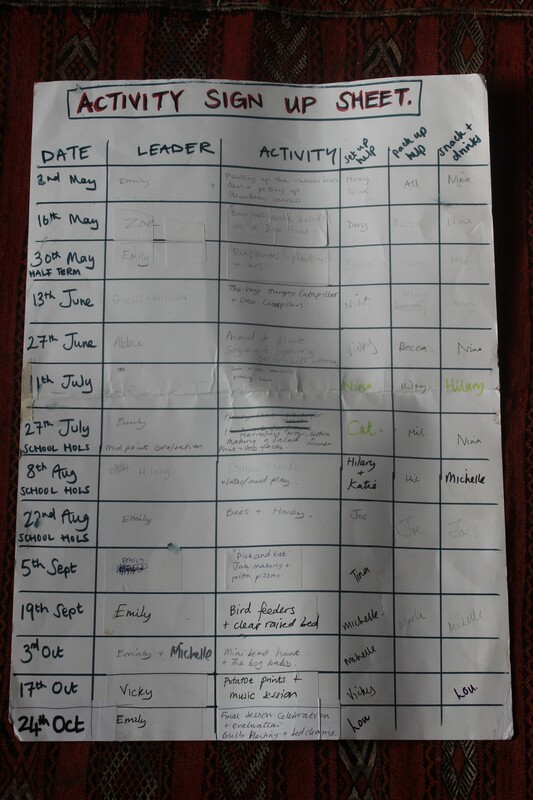 And finally I just want to share my sheet for keeping a record of who is leading each session and the topics covered. This tiny bit of design worked really well, giving flexibility in the planning and in encouraging people to sign up for jobs where they saw gaps. The sheet was A1 size and displayed on the shed during each session. 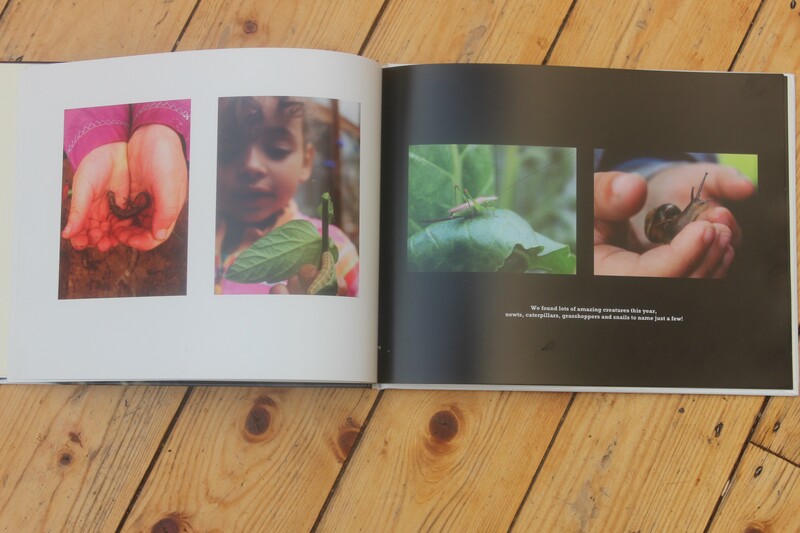 This entry was posted in Uncategorized and tagged Appreciation, design process, design tools, design web, Evaluations, Muddy Boots, PDC, Permaculture, Permaculture Diploma, Reflection by emilycrofton. Bookmark the permalink. Thanks you! It is always encouraging to hear that people are actually reading and enjoying my blog. I really like the process of writing it all down and recording progress. Doin this in a public form has been quite motivating!